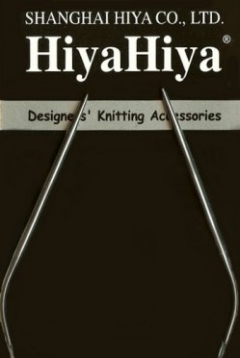 HiyaHiya’s 12-inch stainless steel circular knitting needles are smooth as silk and made with flexible cables and near perfect joins. The curved needle tips are 3.5 inches. Your 12" needles in the size 6 & size 7 are wonderful. They are just what I wanted & needed & am SO GLAD to have found them. Smooth & sturdy & I know they will last forever. I've had another 12" needle in size 5 & have used it many years. Thank you for your excellent needles. Very smooth and easy to use. They make working with thin yarns much easier to get perfect tension. Will be ordering these in another size soon.